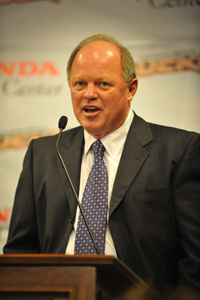 Former Senior VP of Hockey Operations Bob Murray will take over as Ducks Executive Vice President and General Manager. The Anaheim Ducks announced today that the National Hockey League (NHL) club has named Bob Murray Executive Vice President and General Manager. At the same time, Brian Burke has been named Special Consultant to Chief Executive Officer Michael Schulman. “Brian respectfully declined our contract extension offer last week,” said Schulman. “With his support, we decided to make the transition at this time in the best interest of the organization. Brian and I have been discussing his future with the Ducks for some time. Once he decided last week not to extend his contract, I decided Bob was the obvious successor and Brian agreed. “Bob’s experience and knowledge of our organization make him the ideal candidate to take over. He’s been a critical member of our organization over the last three seasons, both as Senior Vice President of Hockey Operations and General Manager of our American Hockey League (AHL) club. Murray has spent 33 consecutive years in the National Hockey League, the last three-plus seasons with Anaheim. He was named Senior Vice President of Hockey Operations on July 14, 2005. Since joining the Ducks, Murray had a vital role in the success of the club, which included a Stanley Cup (2007), a Pacific Division title (2007), and three consecutive playoff berths. Brian Burke steps down into a Special Consultant role after more than three years as Ducks Executive Vice President and General Manager. Murray’s previous responsibilities included overseeing all aspects of player development, serving as General Manager of Anaheim’s AHL affiliate (now the Iowa Chops). Prior to the club’s affiliation with Iowa, Murray was the General Manager of the Portland Pirates from 2005-06 through 2007-08. The Pirates went to the Conference Finals twice (2006 & 2008), appearing in six playoff rounds. Anaheim and Portland combined to win 10 and appear in 14 playoff rounds over the last three seasons, the most of any organization in hockey. 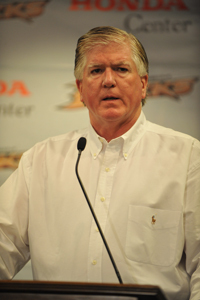 Prior to joining the Ducks, Murray worked as a Professional Scout with the Vancouver Canucks from 1999 to 2005 under then-General Manager Brian Burke (1998-2004). Before his stint in Vancouver, he served as a Scouting Consultant for Anaheim during the 1998-99 season. Murray was a member of the Chicago Blackhawks organization for 25 years, serving as General Manager from 1997-99. He was named the sixth General Manager in team history on July 3, 1997 after serving as Assistant General Manager under Bob Pulford for two seasons. Before joining upper-management, Murray was named the Director of Player Personnel in 1991 and was largely responsible for the club’s NHL Entry Draft selections over eight seasons. Drafted by the Blackhawks in 1974, Murray spent his entire 1,008-game, 15-year career in a Chicago uniform. He was named to both the 1981 and 1983 NHL All-Star Games. Murray retired at the conclusion of the 1989-90 season and remained with the organization as a Professional Scout. Burke was named Executive Vice President and General Manager on June 20, 2005. Over the last three seasons, the Ducks captured their first Stanley Cup (2007), first Pacific Division title (2007) and first two 100+ point seasons (2006-07 & 2007-08). The club has qualified for the playoffs all three years, winning six-of-eight playoff series over that span. Only the Detroit Red Wings have matched the Ducks success over that stretch, having also won six-of-eight postseason series. Burke also received two prestigious honors in the summer of 2008. On June 6, Burke was named the General Manager of the 2010 U.S. Olympic Hockey Team by USA Hockey. On, Aug. 7, 2008, he was named a recipient of the 2008 Lester Patrick Award for outstanding service to hockey in the United States. He joined Ted Lindsay, Phil Housley and Bob Naegele in the Class of 2008.